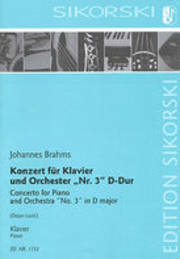 Sikorski Music Publishers have just published the sheet music of Brahms / arr. Lazić: Concerto for Piano and Orchestra “No. 3” in D major (after Violin Concerto, op. 77). After the premiere of this work in 2009, and the CD release in 2010, Dejan performes this arrangement regularly with orchestras throughout Europe, North and South America, and Asia. In 2009 Dejan has completed a six-year-long project, an arrangement of the beloved Brahms Violin Concerto for Piano and Orchestra – after Bach and Beethoven, who arranged their own Violin Concertos as Piano Concertos, here we have now the third ‘great B’ in such an arrangement. On 1st October 2009, Brahms / arr. Lazic Piano Concerto “No. 3” in D major (after Violin Concerto, op. 77) had its World Premiere in the United States with Atlanta Symphony Orchestra & Robert Spano.The live recording of this concert has been released in January 2010 and is among Channel Classics’ bestsellers! The UK Premiere succeeded at the BBC Proms in London on 11th August 2011 with BBC Philharmonic Orchestra & Vassily Sinaiskyand the Dutch one at the Amsterdam Concertgebouw in September 2011 with Netherlands Chamber Orchestra & Gordan Nikolic. In February 2012 Dejan performed this piece with the Residentie Orkest & Andrew Grams in The Hague and in Utrecht and on 2nd March he gave its Japanese Premiere in Sapporo with the Sapporo Symphony Orchestra & Tatsuya Shimono. The German Premiere of the piece followed promptly at the ‘Ostertöne Festival’ in Hamburg on 9th April 2012 with Hamburg Philharmonic Orchestra & Simone Young. In spring 2013 Dejan performed this work also with Indianapolis Symphony Orchestra & Krzysztof Urbanski and in September 2013 he gave the South American premiere with Orquestra Sinfonica do Estado de Sao Paulo & Lawrence Foster. In summer 2014 he gave its Polish Premiere at the Chopin Festival in Warsaw, in spring 2016 he performed it in Düsseldorf, Germany, with Düsseldorf Symphony Orchestra. In spring 2018 Dejan gave its Finnish Premiere in Tampere, with Tampere Filharmonia & Tung-Chieh Chuang. Further concerts are already being planned.